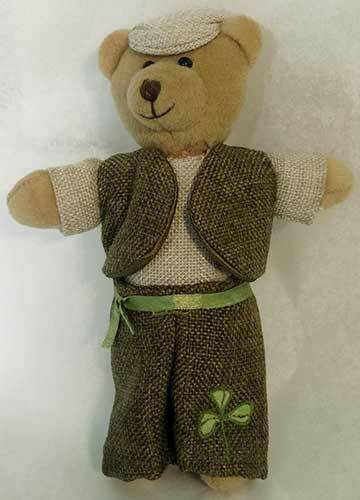 This Irish Teddy bear is a charming little boy named Paddy who dressed in an authentic satin lined Irish tweed vest, cap and pants that is enhanced with embroidered green shamrock. The doll is 100% polyester and stands 7 1/2" tall. This stuffed Irish Teddy bear is made in Ireland by Islandcraft and he is complete with a shamrock history card, complements of The Irish Gift House.